The recent conflagration at Grenfell Tower in London seems destined to be one of those defining moments which socially and unconsciously resonate for generations. At its most simple ( if it can be described as such ) it is an indescribable tragedy where upwards of 80 people lost their lives. At its most complex, it can be seen as a metaphor for the ongoing battleground between political, social and economic groups at different ends of a spectrum, and for the reductionist set of values current political classes have displayed towards the most poor and disadvantaged within our society. That this battleground exists within one of the most affluent areas of the UK creates further almost unbearable tensions. Although essentially a humanitarian tragedy, there is little chance it will be seen in any terms other than political. Clashes between council and housing organisations portraying extreme conservative ideology and a population group frustrated by continuing austerity and cutting safety corners predate this tragedy. Literally inflamed by resident’s concerns regarding safety being ignored for years by the same organisations, those angers and conflicts are currently visible during meetings between elected local government officials and representatives of the local tenants; early post-tragedy attempts to hold meetings behing closed doors suggested continuing extreme differences of opinion. In 1948 the Empire Windrush docked in Kingston, Jamaica, to pick up Carribean servicemen who were on leave. The recently introduced British Nationality Act 1948 gave British citizenship to all people living in Commonwealth countries, and full rights of entry and settlement in Britain. Midsummer, also known as St John’s Day, is recognised on June 24th by the Christian Church June as the feast day of the early Christian martyr St John the Baptist, and the observance of St John’s Day begins the evening before, known as St John’s Eve. Traditional Midsummer bonfires are still lit on some high hills in Cornwall. This tradition was revived by the Old Cornwall Society in the early 20th century. The ancient festival was first described by Dr William Borlase in 1754 in his book Antiquities of Cornwall. The photographs here and on the associated Gallery were taken over the Summer Solstice recently in West Penwith, Cornwall. The title of this blog post is taken from the Martha Tilston song Who Turns, found on her Lucy and the Wolves cd. The song is a meditation on the meaning of life and everything, using the metaphor of moonlight to suggest that we are more than just hapless creatures on the treadmill of life. Martha suggests that we all have a freedom and glory to our existence we may not currently realise. Following considerable time spent in Morocco, and the accumulation of many images, it became compelling to try to undertake a more permanent presentation of some of the photographs taken. The most moving experience for me was the time spent in Chefchaouen, in the Rif mountains, where the city is predominently painted in variants of the colour blue. It is thought that this application of blue was started by Jewish inhabitants who considered blue to be closer to heaven, and the colour was applied liberally throughout the city. There is also considerable parts of the nearby coastal city Essaouira painted blue, and this is a city recognised as the site of primary occupation of Jewish communities throughout Morocco. Perhaps there is a correlation. ‘Saints’ in Morocco have a very different interpretation than those in Europe. In Morocco saints can be ordinary people who had a lifetime of ‘doing good’. Saints can be either rich or poor, educated or uneducated, employed or unemployed, living within a home or homeless. They are considered to have ‘ lights of guidance because of the blessings that Allah showered upon them’. The whole notion of wandering saints in Morocco fascinated me when I first visited Morocco. A vision of marabouts walking the countryside, giving solace to the poor and medicinal aid to the unwell, and then eventually dying and having a tomb built over their resting place was intriguing. Further reading, predominantly Realm of the Saint : Power and Authority in Moroccan Sufism by Vincent J Cornell has replaced that idea with a more accurate picture of what the evidence suggests; Moroccan ‘saints’ had a spiritual role, that of “substitute of the prophets” (known as walaya), though not entirely representative of traditional Islamic interpretation . Their other role comprised that of political and local ‘fixers’ (wilaya), settling disputes and often representing the poor against rapacious Shas and tribal chiefs, treading a delicate line between influencing powerful landowners and doing what was possible for the disadvantaged. Choosing between the sacred and the profane has always been problematic; making that choice at an African music festival is a particularly difficult decision. 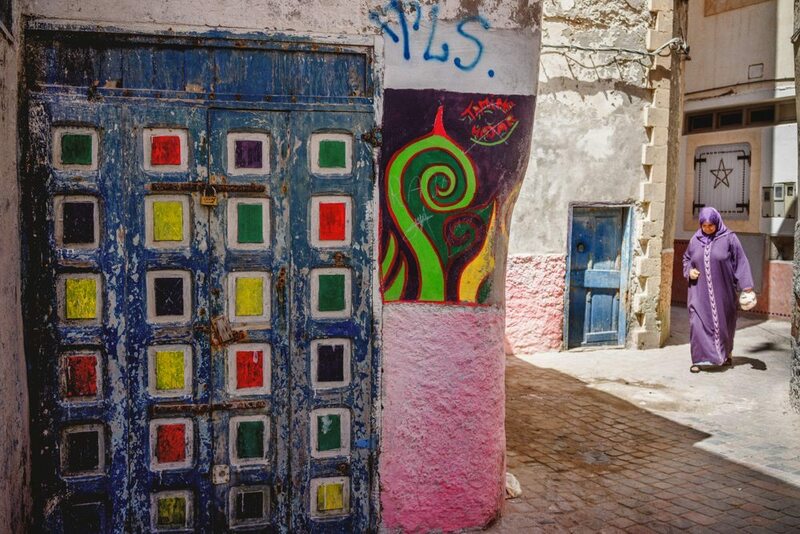 A mellah is a walled Jewish quarter of a city in Morocco, analogous to the European ghetto. Jewish population were confined to mellahs in Morocco beginning from the 15th century and especially since the early 19th century. It first was seen as a privilege and a protection against the Arabs’ attacks in the region, but with the growing of the population, it then became a poor and miserable place. In cities, a mellah was surrounded by a wall with a fortified gateway. Usually, the Jewish quarter was situated near the royal palace or the residence of the governor, in order to protect its inhabitants from recurring riots due to its inhabitants playing a vital role in the local economy. In contrast, rural mellahs were separate villages inhabited solely by the Jews. The mellah is now one of the poorest neighborhoods in Essaouira, located within the walls in the northern part of the medina. Jews came to Essaouira for the wealth of the port and the trade opportunities it offered, taking advantage of attractive incentives to handle the trade with Europe by Mohammed 111 in the 18th century. Jews once comprised 40% of the population, and the mellah contains many old synagogues. The city flourished until the caravan trade died, supplanted by direct European trade with sub-Saharan Africa. Despite its less traditional interpretation of Muslim faith, Morocco remains a devout country. Mosques remain the centres where Islam is worshipped, but a series of other religious institutions, called Zaouias, have an immersive spiritual and civic role. These are often formed around a particular saint or Sidi and maintained by that person’s family. A variety of spiritual, cultural and civic activities occur at these centres. Reflecting the spiritual nature of traditional Gnawa music, two Zawiyas hosted a number of concerts over the Gnawa festival. These events started at 11pm and lasted about 3 hours. They took the form of shorter ‘lilas’, where music, incense, dance and trance encourages personal transformation and relief from either illness or spirit-possession. Possession by djinns ( bad spirits ) remains a commonly held belief today. These photographs depict members of the Zaouia Aïssaoua preparing for the procession and opening of the 19th Gnaoua and World Music Festival, commencing 12th May 2016 at Essaouira. I had visited most of the zouias in Essaouri several days earlier and this particular brotherhood was the most welcoming of all, inviting me back to watch their preparations.